From time to time, people ask me if I’d be interested in working with them to make something bigger happen. I’m getting better at saying no. I want to focus on learning how to direct my own life. Other-directed work is seductive. Clear tasks! Appreciation! My mind wanders back to it, thinking about whether it’s better to spend this hour doing something I know people want, or something that I think might help me and others grow. But I have the space to explore more, and I need to learn how to use it. Sometimes, to remind myself, I flip through the spreadsheets of my finances and projections. I joke about this being an experiment with semi-retirement. I don’t know how close to the truth it is, since circumstances can always change, but I’m ahead of where I had hoped to be. If the numbers do work out, what difference would it make? Mainly the freedom to focus on things beyond what people are clearly willing to pay me for. People might be able to pay others to do the same work I would have done, but few people are in the position to do the things I can choose to do. What do I care about, then? What do I want to work on building as part of this experiment? 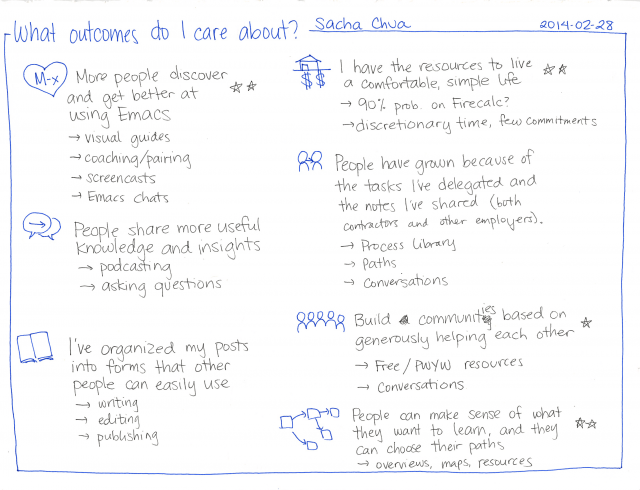 What outcomes do I want to support? Other people’s useful knowledge and insights: People know all sorts of things, but they struggle with sharing. If I get better at asking questions and podcasting interviews, I can help people share what they know in a form that other people can come across. Organized info: I want to take notes along the journey instead of waiting until the end – even if it means capturing detours and dead ends. Organizing, editing, and packaging those notes makes it much easier for people to catch up, though. I can add sign-posts to mark the trail. People can always wander through the side-trails if they want to, but at least they can choose. Managed resources: I’d like to be able to confidently embark on the next experiment. Frugality and good decisions make that possible. Limiting commitments and needs will help a lot, too. Delegation: I want to be able to delegate well, so that I can involve other people in making things happen without wasting people’s time or attention. I think it would be a good idea to build up a process library and paths for developing skills. It’s like applying open source principles to management and processes. I want to help my team members build their skills, and I also want to help other employers and potential employers delegate more effectively. Community: I want to experiment with building communities based on generously helping each other, and I’m doing that by sharing as much as I can for free. I love how people reach out to me for questions and conversations. Maps and resources: Topics can be intimidating to learn. I want to help people make sense of what they’re learning, and this is where drawing overviews and creating resources can help. At least for the duration of this 5-year experiment, I don’t need a salary or a flow of clients. 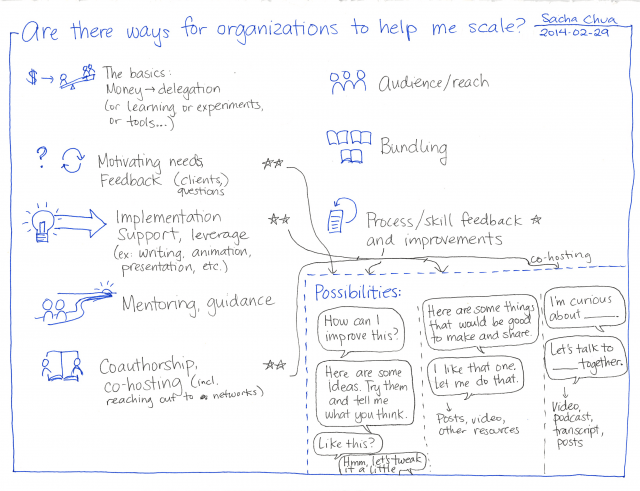 The only reason to work with an organization or enter into any new partnerships, then, would be to take advantage of the scale in order to do things that I can’t do as effectively on my own. 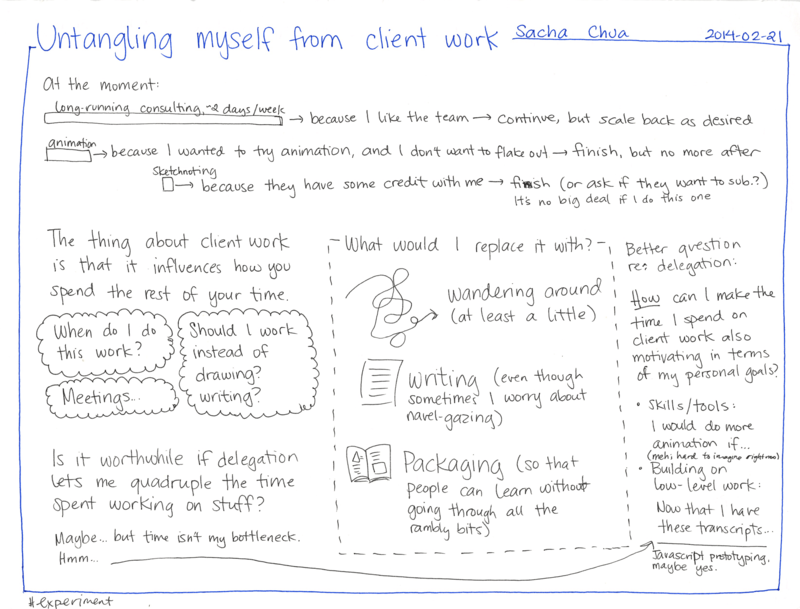 So far, I’ve been referring all work to other people (except for previous commitments). Would there be reasons for me to connect with other people who are working towards similar goals, whether through a formal partnership or an informal relationship? Money isn’t enough as a motivator. Yes, I can turn surplus money into delegated time or invest in learning, experimenting, and improving my tools (and there’s always using it for extra safety). Money is not a limiting factor, though. 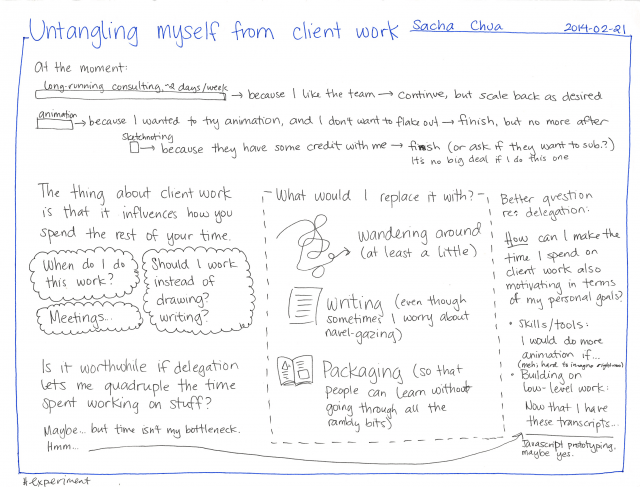 Motivating needs, feedback: One of the benefits of working with clients or organizations is that people need stuff that I might not have thought of myself. They can also give me feedback on whether what I create works for them. This can be better than making stuff in a void and wondering if it will be a good fit for anyone else. That said, though, it’s tempting to focus on what people want instead of what I’m curious about that might turn out to be good anyway. I might be okay if I get a stream of ideas without any commitment to work on them, so I can choose the things that interest me. Implementation support and leverage: This one is interesting for me. For example, I can help brainstorm a list of things that would be good to make (blog posts to write, videos to record, etc.). We can work on them, bringing different skills to the table. Or I might hand it off entirely; I don’t need to write the blog post or tutorial myself. Mentoring and guidance: I can learn something from people who are further down the path (or who have traveled a different but relevant path). It takes a little translation to make sure I’m still following my dreams, though. Co-authorship, co-hosting: This one is interesting for me too. One of my goals is to help people get stuff out of their head and into a form that other people can learn from. Asking people questions is one way to do this. I don’t always know who knows stuff I’m curious about, and it would be great to tap other people’s networks (especially if someone can go to the trouble of coordinating with guests, etc.). Talking to other people about the things we do differently will help us learn more, and there’s probably a book or two in there. Audience and reach: Less interesting for me, mainly because I’m not focused on being more popular or reaching more people. I am, however, up for more confederates. Bundling: This is related to audience and reach. Have people written about topics that complement topics I’m interested in? We can offer something more useful together, maybe. Process / skill feedback and improvements: This is probably the most interesting for me. I’m happy to swap ideas about what could make something better. 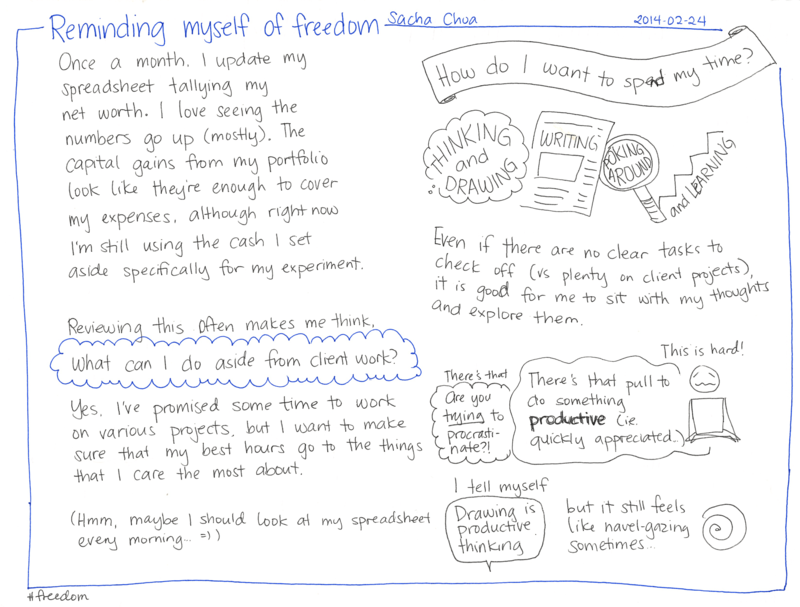 That helps me reflect on and communicate what I do differently, and I learn from other people too. I might pick up tips along the way, too. Helping people who will try things out and share their experiences: For example, we might discuss a blog post. I’d show how I might do things differently or suggest some things to try. You give it a shot, and we discuss what that’s like and where you want to go next. 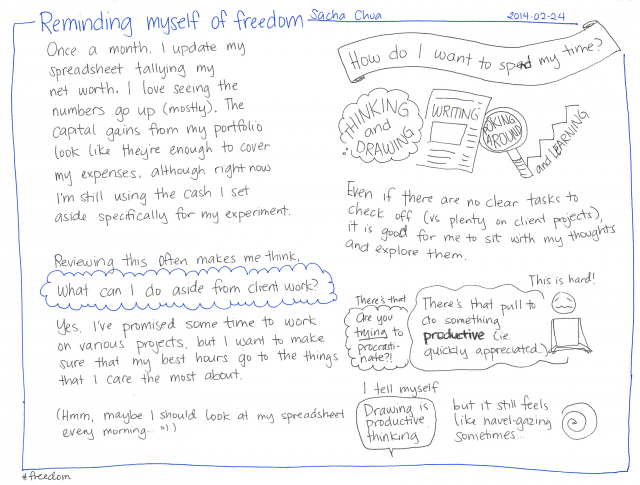 Ideally, I’d work with people who blog about what they’re learning along the way, so those ideas get written up and shared too. If not, maybe they’re open to having the coaching in public, so I can just post that. At the very least, I can harvest the tips myself and put them into blog posts. 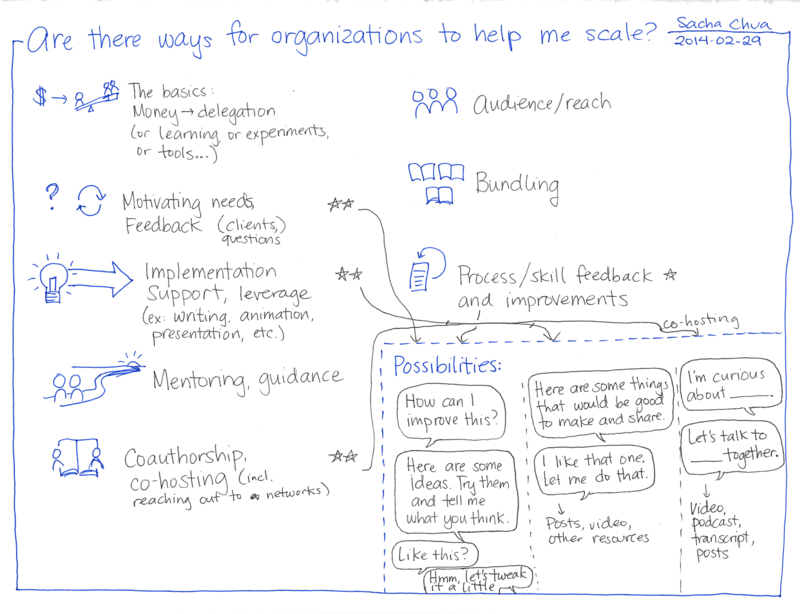 I’m interested in scale, so helping people who help others might work out. Brainstorming ideas and directing work: We might come up with a list of things that would be good to make. Then you or your team can make that happen, and I can give feedback. It’s kinda like the books I want to write or the things I want to fix. I don’t mind if other people get to it first, as long as it gets done. Picking people’s brains together: We come up with topics of mutual curiosity, and you find someone who can speak about the topic. I’ll float the idea by my network too. We chat, and the whole thing gets recorded, transcribed, posted, etc. I think I’ll do this on a free/pay-what-you-want basis as well, as an experiment. I want people to talk to me, because I learn a lot from the process. Comments, conversations, confederacies, and long-term relationships are awesome. If you’re charging people for stuff (directly, through sponsorship, etc. ), it’s probably fair that you pass some revenue on as a way of indicating the value you perceive. That mostly translates into more experiments anyway, so you can indirectly encourage me to explore the kinds of stuff you’re also interested in. Maybe you’re working on something that’s a great fit for an outcome that I’m working towards too, or you’re working on something that could benefit from short, commitment-less help from me. Reach out with what you’re interested in. Pick something that we can discuss in 15-30 minutes. (As it turns out, you can cover a lot in 15 minutes.) I’ve committed to working on stuff that’s publicly available, so focus on things like blog posts, videos, resources, etc. If it tickles my fancy, we’ll bounce around ideas or approaches. That should be good for letting me give focused, specific help, while keeping my mind uncluttered so that I can focus on the things I want to do that are less common. =) Let’s see how it works out! 2017: What did I learn from this experiment with semi-retirement? 2004: Got planner-rmail to work. Yay! 2004: What would be a fun blog visualization hack to see if I can still get the hang of it?